The high pressure grinding rolls technology originated from the coal forming technology of the early 20th century. In 1979, Professor Schonert patented the high pressure grinding rolls. In the mid-1980s, the high pressure grinding rolls began to be used in the crushing work in the cement field to process fragile materials. The huge economic benefits have revolutionized the energy saving and productivity improvement of the cement industry. Since then, with the advent of new wear-resistant roll faces, high pressure grinding rolls have been used to process harder, tougher, more abrasive minerals and are now widely used in diamond, iron ore, limestone, copper ore and gold. Fine crushing and ultra-fine crushing of ore. Compared with the traditional grinding process, the high pressure grinding rolls process is mainly reflected in energy saving, pre-tailing to reduce the amount of subsequent grinding, and to improve the subsequent processing index. Compared to conventional crushers and mills, the main technical advantage of high pressure grinding rolls is energy savings. According to the application experience of domestic and foreign selection plants, the high-pressure roller grinding process saves 15% to 30% compared with the traditional grinding process. Compared with the traditional crushing and grinding equipment, the high-pressure roller mill acts differently on the material, and exerts a relatively slow force on the material particles, so that the internal structure of the material is destroyed and the energy utilization rate is high. The energy-saving advantage of the high pressure grinding rolls is also reflected in the fact that after the material is rolled, micro-cracks are generated inside, which reduces the ball-grinding index of the subsequent grinding, so that the unit power consumption of the subsequent grinding is reduced. 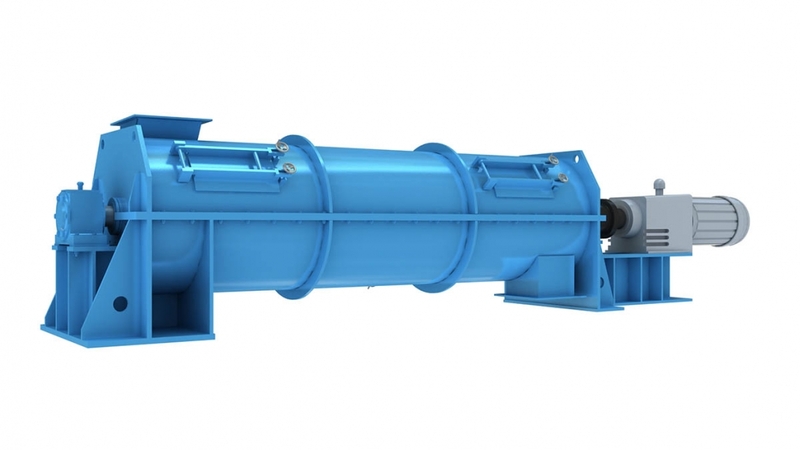 In addition, compared with the conventional crusher, the high-pressure roller mill will increase the fine powder content and reduce the unit power consumption of subsequent grinding. If the high pressure grinding rolls is used as a superfine crushing device after the third-stage crusher, it can be called a quasi-grinding process, and the particle size is close to the self-grinding/semi-self-grinding grinding effect, which can meet the requirements of the conventional rough grinding and early tailing operations. The requirements of particle size, dissociation and other characteristics, combined with wet coarse-grain tailing, can significantly reduce the subsequent grinding amount and increase system capacity. For some ultra-poor magnetite ore (TTe < 15%) with a coarser grain size, the advantages of high pressure grinding rolls are even more pronounced. After the rolling product is classified, magnetic pre-concentration is carried out, which can throw away a large number of gangue, improve the grade of grinding ore, reduce the subsequent grinding treatment, reduce the cost of ore dressing, and improve the utilization value of the super-poor magnet deposit. The crushing of the high pressure grinding rolls is quasi-static crushing. The material layer is pulverized. After the material between the rolls is squeezed, the material and the material are pulverized with each other, and a large number of cracks are generated inside the particles to make useful minerals in the subsequent grinding. Dissociation in advance can reduce the feed size and drug consumption of subsequent selection within a certain range. At the same time, the generation of micro-cracks in the rolled product can reduce the over-grinding and muddy phenomenon of subsequent grinding and improve the subsequent processing index. There are a large number of micro-cracks inside the high-pressure roll mill product, which makes it uniquely advantageous in the heap leaching process, allowing the leachate to penetrate faster and deeper, increasing the leaching speed and leaching rate of useful minerals, and reducing the heap leaching process. Complexity, reducing upfront investment and operating costs. The dry screening of the high-pressure roller mill needs to be equipped with a dispersing machine to break up the rolling cake, otherwise the screening efficiency will be greatly reduced. In addition, since the whole process adopts dry grinding, dry screening and dry sorting, the moisture content of the material is required to be high, and it is not suitable to treat materials with high water content. At the same time, attention should be paid to dustproof work, and dust removal is required. Equipment, etc. The process is mainly applied to non-metallic minerals and ore containing less mud, as well as water-deficient and arid areas.